This week we have made the first batch of Cordial. Last years vintage stood us in good stead and we have only just used up the frozen batches so we have had a whole year of bottled sunshine. It’s funny when you start looking for Elderflower bushes, you see them everywhere. I even found some peeping over the wall from our next door neighbours so I snipped a sneaky bunch. 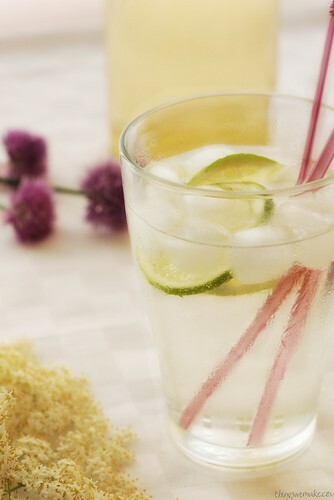 This year I have followed the recipe posted on the fabulousplaces blog and added lime to the mix and it is really refreshing. 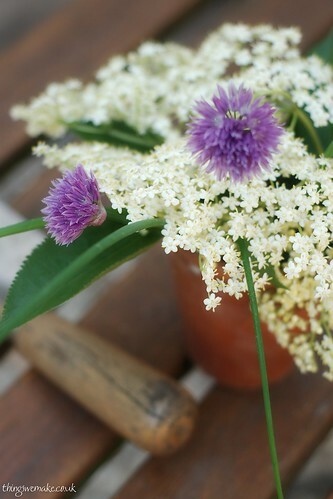 Gently shake the Elderflowers; this will remove some of the little critters! Using a very large bowl, carefully pour the boiling water over the caster sugar. Stir the mixture well and leave it to cool. 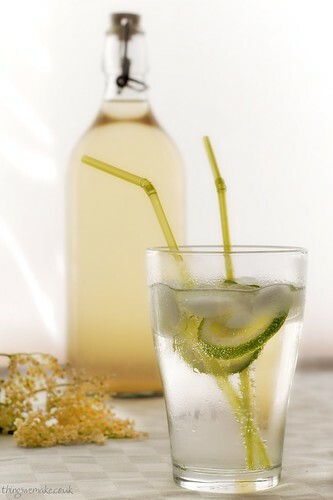 Add the citric acid, sliced lemon and limes and finally the elderflowers. Leave the mixture to cool in a safe place for approx 24 hrs, stirring occasionally. The final step is to strain the mixture through muslin. Once this is done the mixture is ready to be bottled in new or sterilised bottles. Sorry to go elderflower mad on my posts but the season is so short you’ve got to make hay while the sun shines. I made some Elderflower Cordial yesterday from the recipe in Celia’s blog and today it looks a bit less pretty but already tastes and smells lovely. I ummd and aahd about whether to make more champagne or more cordial and in the end the cordial won out as it is freezable and therefore will allow us to taste the Summer through ’til Winter. Also it is less dangerous, I don’t need explosion proof bottles and you can turn it into something fizzy by the addition of soda anyway. Plus I bought lots of citric acid that was pretty much burning a hole in my pocket. 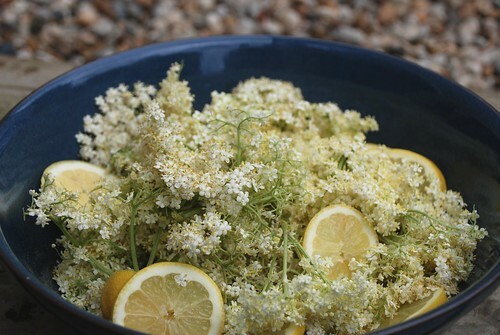 You only need a smallish bag of elderflower blossom. We did not realise this until we got home with sackfuls of the stuff! One and 3 quarter bags look like a whole lot of sugar in the pan! The 24 hour old batch is now golden and syrupy and ready to bottle. Okay, enough already with the elderflower. I am off to do some baking! Perhaps I look more like someone who cuts illegal substances than you! 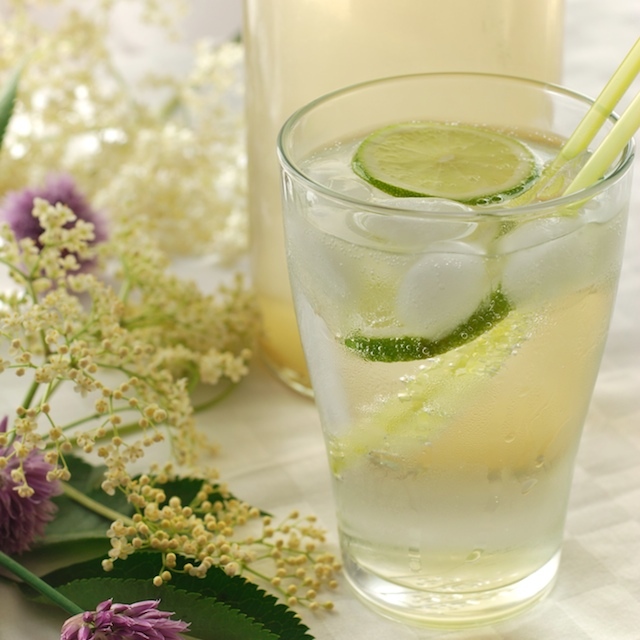 Hi Claire, Just searched back for your Elderflower recipe as its been on my mind to make some cordial since last year (when it was too late in Summer might i add). The thing is i am terrified i pick the wrong things and kill people. Any tips? I’m sure you won’t! Don’t worry! The big photo at the top of the post should be a good guide. The only things that are similar are things like cow parsley or hogweed, but they are just green plants and grow green from ground level up to chest height. Elderflower will always be on some sort of scrubby tree or bush with beige, twiggy branches supporting the softer green and white flower heads. The leaves are serrated and normal ‘leaf shaped’! I’m sure you’ll recognise the smell too. If it smells of cat wee it’s a little too old! Try picking in the morning as it’s better fragranced then usually, but the flowers must be open or the pollen won’t flavour the cordial. You can normally get all you need from one or two bushes as you don’t need loads. They are not flowering yet around us but you can always Instagram if you find one and I can confirm for you! Oh and you might need to ask for citric acid as they sometimes keep it behind the counter to avoid people nicking it to cut with drugs, apparently.